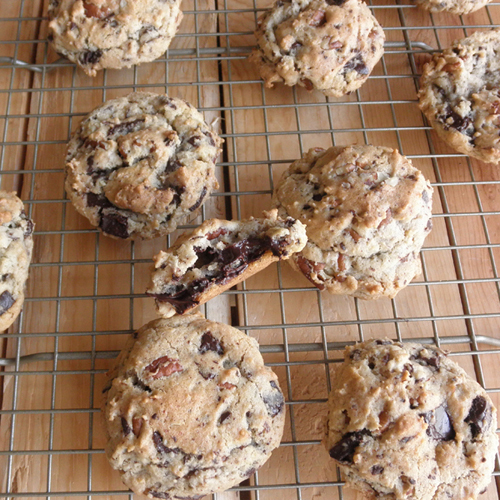 I've already posted the recipe for these cookies sans pecans, so I'll post it again below with the pecans. I thought, though, that today was also a good day to type out some of the truths about cookie making that I've discovered through the years--some through trial and error, some through my avid Food Network viewing, and some through other sources I can't recall. I'll break it down into "Basics" and "My Preferences," just so the difference is clear. Follow the recipe--winging it in baking is never a good idea. Use all purpose flour, unless otherwise specified. Use a whisk to mix the dry ingredients together when you have to mix them. The higher the quality the ingredients, the better the product. When the recipe calls for butter to be soft, make sure it's soft--an hour on the counter is best; next best is microwaving a stick of butter at 50% power for about 20 seconds. Using all butter creates a flatter, crisper cookie. Using all vegetable shortening creates a taller, more tender cookie. 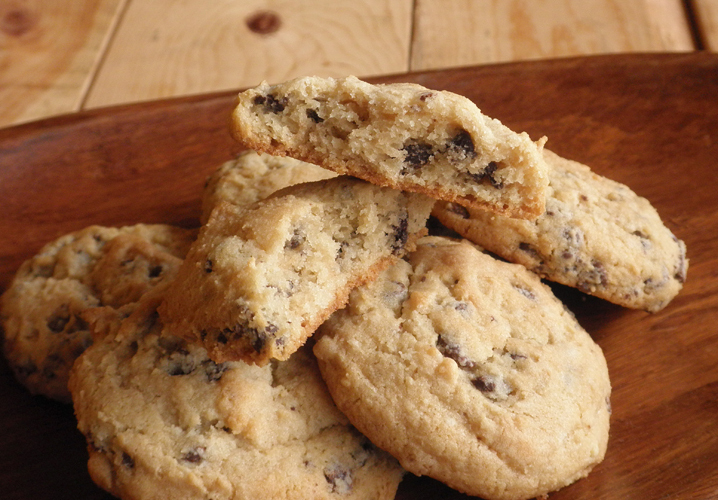 Using a mix of butter and shortening produces crisp, medium-height, crisp-edged, sort of chewy cookies. Using about half cream cheese and half butter creates slightly dense, chewy, stay-fresh-longer cookies. 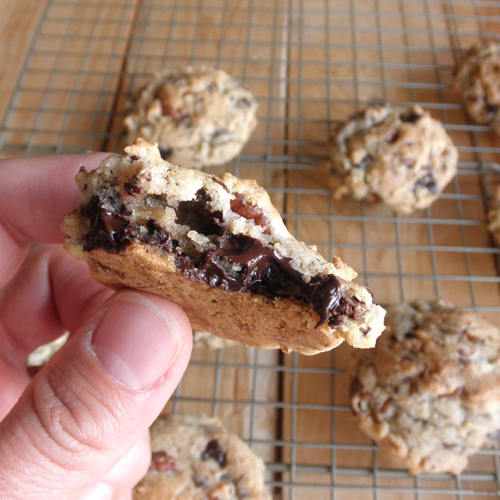 After the flour is added, only mix until combined--over mixing can mess up your cookies. 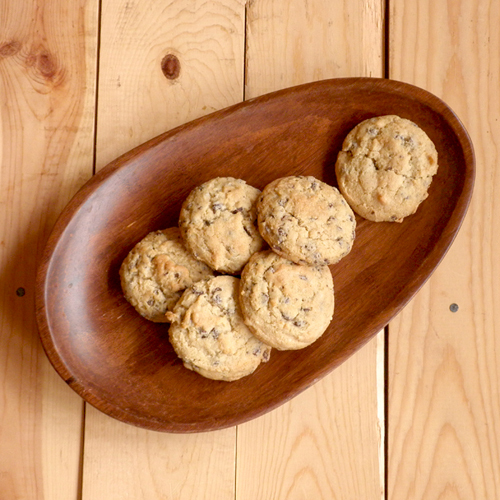 Refrigerating the dough usually helps make cookies chewier and less flat. For fresh baked cookies any time, freeze cookie dough in balls--dough for chocolate chip cookies, dark chocolate cookies, and snickerdoodles freeze well, but peanut butter cookies and oatmeal cookies don't do as well after freezing. Those cookies never quite flatten out enough after freezing. 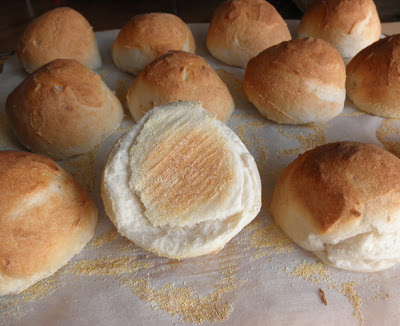 You can also keep dough refrigerated in an airtight container for about a week and bake a few at a time. Again, if you won't be baking it all within the week, think about freezing it in balls. 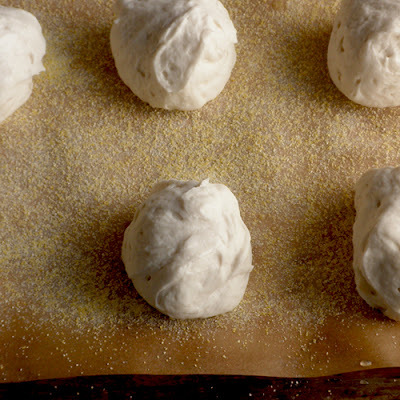 To freeze dough, after making dough, scoop onto wax paper lined baking sheets, freeze, and the place balls in zip top baggies and store in the freezer. If you use a cookie scoop with a spring action, avoid scooping super hard dough--I've messed up too many spring actions trying to unmold hard cookie dough. King Arthur Unbleached All Purpose Flour is my flour of choice. I like C & H Sugars (white and brown), and Dove Dark Chocolate, even though I have to unwrap them every time I use them. A standing mixer makes life so much easier. 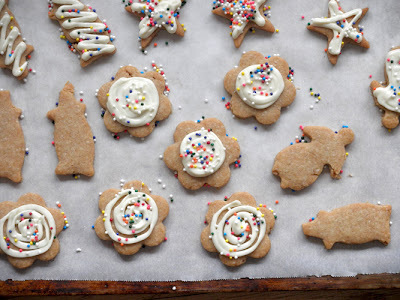 Use parchment paper for easy cleanup and better browning on the bottoms of cookies. If you're going to use nuts, toast them in the oven on a baking sheet at 300 degrees Fahrenheit for about 10-15 minutes, stirring every 5 minutes and making sure to keep an eye on them so they don't scorch--this adds another dimension to the flavor. I use Airbake pans--my cookie bottoms never burn and when you use this pan that only has a rim on one of the four sides, you can easily slide the cookies on the parchment paper onto the cooling rack to immediately stop the cooking. When you leave the cookies on the hot pan, they continue to bake a little after they're out of the oven. As mentioned above, I usually freeze my chocolate chunk/chip cookie dough in balls. I'm a cookie snob and a freshness snob. Freezing the dough ensures that the cookies I serve and eat are super fresh. I generally only bake what can/will be eaten within 24 hours. Cookies made with cream cheese stay fresh longer for some reason, and cookies that don't have any egg (like shortbread and Swedish Cream Cookies) last a while longer as well. And when I say "a while" I mean I'll keep them around three days before tossing the leftovers. I know, I know--a lot of you out there will think I'm a freak. I'm fine with that. I don't want to waste calories on stale cookies. Ever. I know there are probably more tips in my head, and I'm certain there are more out there in the world. Please leave a comment if you have some tips of your own so that the rest of us can benefit from your knowledge and experience. Thanks for reading! 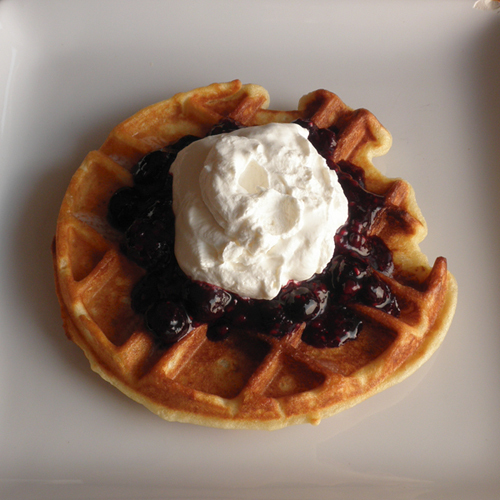 Using a mixer fitted with paddle attachment, cream butter, cream cheese, and sugars until very light and fluffy, about 3 to 5 minutes. Add the eggs, one at a time, mixing well after each addition. Mix in the vanilla. Scrape down the sides of the bowl with a rubber spatula as needed. Reduce the mixer speed to low/stir; then add dry ingredients, and mix until just combined. Add the chocolate chips and pecans, and mix briefly to incorporate. Place in an airtight plastic container, and refrigerate for 24 to 36 hours. Once chilled, you can bake or scoop dough balls to freeze for later baking. Now here is where you have to decide what size to make the cookies (unless you made the balls earlier for freezing). I used a medium sized Pampered Chef cookie scoop, which is probably about 3 tablespoons. Bigger is probably better with these cookies. (For Me-For You used a 1/3 measuring cup for hers.) 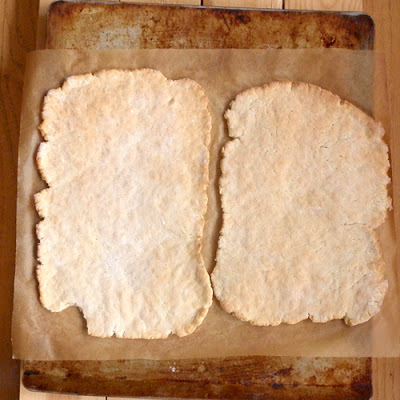 Place scoops onto parchment lined cookie sheets and leave about 2 inches between cookies. Bake cookies for 12-14 minutes or until puffed and browned at the edges. Transfer the baking sheet to a wire rack for 10 minutes, then transfer the cookies onto the rack to cool a bit more. I think these Animal Cookies taste better plain. I've got this fairly large container of nonpareils burning a hole in my cupboard. I love those things, but it's hard to really work them into many recipes. 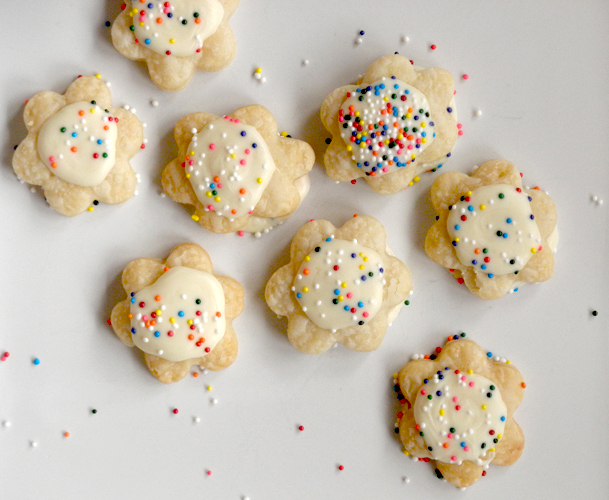 I tried making some cream wafers with nonpareils, and they were okay. Too flaky, I think. Since I was sort of going for those yummy Mother's Animal cookies, I thought I'd try an animal cookie recipe next. I went to my trusty KingArthurFlour.com and of course they had a recipe because they sell some cute animal cookie cutters. Well, I don't have those, so I used whatever small cutters I have, which ended up being stars, flowers, circles, pigs, and a man and woman. They work, but they're the reason I had to put the quotation marks around the word "Animal" in the title of this recipe. I don't even know if the vanilla chips and nonpareils on top really work. I prefer these plain, I think. At first I didn't think I really liked them because I'm not a big fan of honey, and you can definitely taste the honey in these. I liked the texture so much, though, that I've kept on eating the plain cookies and they're growing on me. They really do sort of taste like animal crackers to me. They're crisp, well-browned, and buttery. Only just sweet enough, which I like. I think I might try these again, in a more graham cracker version using some whole wheat Graham flour and with some molasses replacing some of the honey. At least that's my plan. I don't even have time to be making and blogging about these. Seriously. My part-time teaching job is really cutting to my blogging time. In a large mixing bowl, beat butter, sugar, honey, salt, baking soda, and vanilla until completely combined. Add the flour and oats, and mix just until combined. Do not over mix. Divide the dough into two equal pieces, flatten into disks, and wrap in plastic wrap. Refrigerate for at least one hour. Preheat oven to 350 degrees Fahrenheit. and line a baking sheet with parchment paper. Turn one piece of the refrigerated dough onto a lightly floured surface. The dough will be very hard, so beat it a little to loosen it up before rolling to to 3/8-inch thickness. 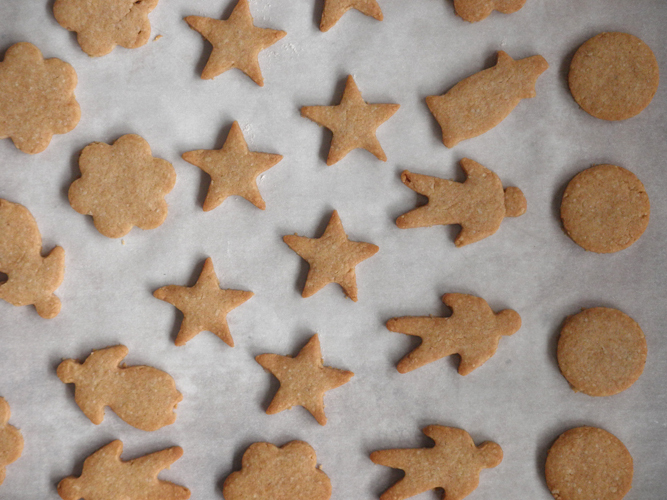 Cut with small cookie cutters and transfer cut dough to parchment lined baking sheet. The cookies don't really spread, so you can fit a lot on one pan; but be sure to leave space for the cookies to bake and brown well, about 1/2 in between cookies, I'd say. Pile scraps of dough up an smoosh into a disk; wrap and refrigerate to make more cookies later. Bake cookies at 350 degrees for 8-10 minutes, or until light brown on the edges. remove from oven, and then transfer cookies to a wire rack to cool completely. If you want them "frosted," place the white baking chips and canola oil in a microwave proof bowl and microwave on high, 30 seconds at a time, stirring in between, until they are almost melted. Then stir until completely melted. 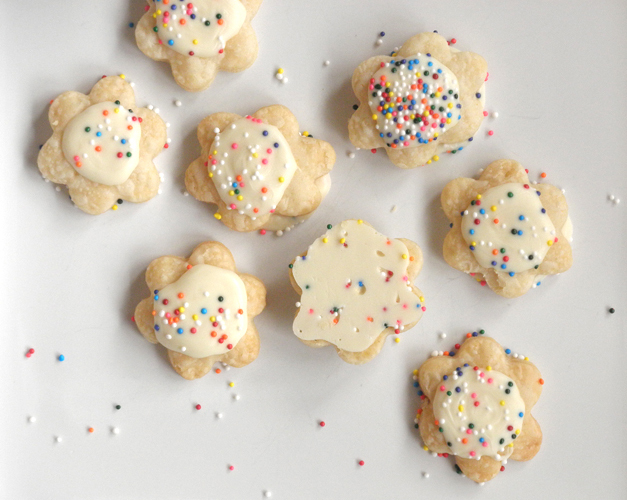 Drizzle, spread, or pipe melted chips onto cookies and sprinkle immediately with nonpareils, if desired. Allow melted chips to firm up before eating or serving. *You can also use oat flour. I took some quick cooking oats and ground them up in my food processor until it was flour-like. Six Minute Egg on Jimmy John's Bread--DElish. My son Ezra wanted sausage for breakfast. I don't have any. So he asked about bacon. Nope. I really need to go to the store. Then he said he wanted eggs, the kind I chop up onto toast. The six minute egg. I do have lots of eggs, but no wheat bread like I normally use. Ah, but I have Jimmy John's bread in the freezer to use for Ezra's lunches. For those who don't live near a Jimmy John's, it's an amazing sandwich place that's ruined Subway for me. I'll never eat at Subway willingly again. Jimmy John's is waaaaay better AND They sell their day old bread for $0.50 a loaf. I can pick up a delicious freaky fast #6 vegetarian and a loaf of bread for just over $5.00. Yes, I am a fan of Jimmy John's. Back to breakfast, though. 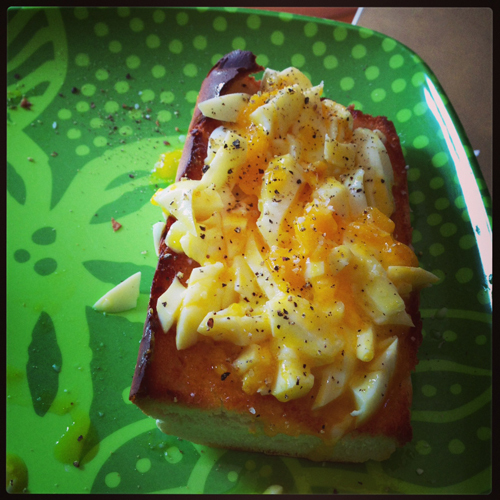 I decided to just toast the bread in the oven, butter it, and put the six minute egg on. It was perfect, and when I posted this pic on Instagram and Facebook, others said they wanted to "steal" my idea. So now I'm blogging about it because I have a blog and I like to push food and food ideas onto people. So here's the super simple recipe for what I did. Oh, and in the original six minute egg recipe, vinegar is called for. I've forgotten about that, and I didn't use it this morning. I'm not exactly sure of the purpose of the vinegar, but my eggs turned out fine, so I'm leaving it out of this recipe. If you want to see the original recipe, you can go to The Village Cook or my six minute egg recipe. Bring water to a boil in a heavy saucepan. Carefully place egg/s into boiling water and set timer for 6 minutes. Place cold water and ice in a bowl that will hold the egg/s you're cooking. When timer goes off, remove egg/s with a slotted spoon and place in ice water until they're cool enough to handle. Gently tap the eggs all the way around on a hard surface and then carefully peel the shell from the egg. 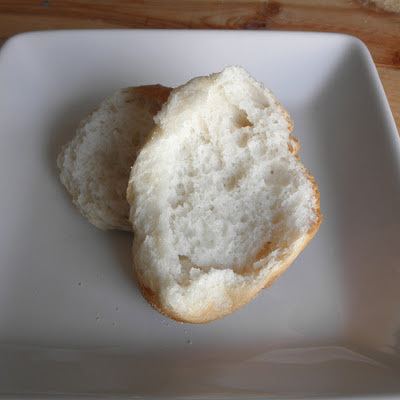 Rinse off any stray bits of shell, pat dry with a paper towel, and place on the toasted bread. Cut into it and enjoy. That is a little chunk I tore off to check the texture. It's good. Well, as I write this, I just realized that I did not allow this batch of pizza crust to rise before baking. Dang it. Hopefully my gluten-limited kid won't reject it. I seem to be burning and messing recipes up more than usual lately. At any rate, this is, so far, the best gluten-free pizza crust that we've tried here for my son who is gluten-limited. (As always, feel free to email me if you'd like the low-down on why exactly we limit his gluten.) I've tried a crust made with Bob's Red Mill GF All-Purpose Flour, but it ended up too gummy, no matter how long I baked it. I also tried to make my favorite ciabatta crust gluten free--sort of, using a GF ciabatta recipe I got from the Better Batter website. Again, I somehow let that get gummy. I knew, though, that I loved the texture of the GF pretzel nuggets I made with the Better Batter, so I just used that dough to make pizza crusts, and what do you know? It works. Well, it works when I remember to let it rise. I make four crusts from this recipe, so I can use one that day and then freeze the rest for the next three times we have pizza. I make regular gluten-ful pizza for the rest of us, and GF for my one son. It's been working out pretty well. The crust you get from this recipe is sort of spongy, firm, but not too hard. It's just a simple, relatively thin, bready crust. Nothin' too fancy, and thankfully, my son likes it. Turn dough out onto a lightly floured surface and cut into four equal pieces. Shape each piece into a pizza crust that is between 3/8" and 1/4" thick. You can make the crusts round, square, oblong--whatever you need to do to make them fit onto your pans, really. Allow to rise for about 20-30 minutes. Gently dimple each crust with the pads of your fingertips. 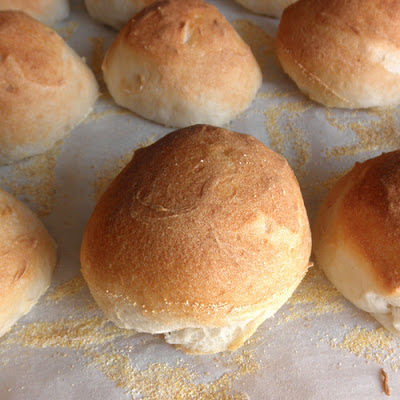 Bake at 450 degrees for about 10 minutes, or until lightly browned at the edges. Allow to cool and either freeze in airtight baggies/container, or use for pizza. Makes 4 small pizza crusts. GF Pizza Crusts before baking. Nothing fancy here. Bottom layer of sweetness makes them better. Last weekend I ended up making some Blonde Nanaimo Bars, when what I'd really set out to do was make something that had some rainbow nonpareils on top. I love rainbow sprinkles. I think I've said it before somewhere on this blog, that using them on cupcakes and cookies just makes me happy. I thought I'd try something simple, and since I had some leftover white baking chips from the Blonde Nanaimo Bars, I thought I'd try making a more delicate version of the Mother's Circus Animal Cookies that I grew up eating and that I still love. I rarely eat those things, though, because they're too addicting. So, today I made a Swedish Cream Cookie wafer and put some of the melted white baking chips on top and then sprinkled on some nonpareils. They didn't seem sweet enough, so I added some more of the melted chips onto the bottoms. This helped, but overall, I don't know if I'd say this experiment was a success. Looking at them makes me happy because of the sprinkles, but I really don't want to eat more of them, the way I wanted to eat more of the Blonde Nanaimo Bars. These wafers just aren't sweet enough. Maybe I'll try this another time and add maybe half a cup of powdered sugar to the wafers. Here's the recipe anyway, in case you like rainbow sprinkles too and have the ingredients on hand. 3. Dust a cutting board with a little flour. Roll dough out a third of the dough at a time to 1/8-inch thick and cut with a 1 1/2” flower or circle cutter. 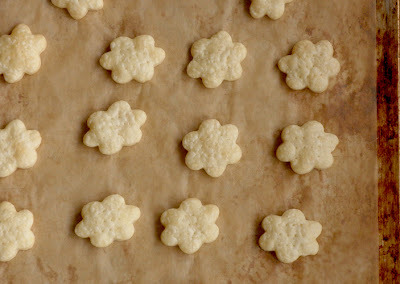 Place flowers/circles on a parchment-lined baking sheet. Prick cookies in the middle three times with a fork. 4. Bake at 375°F for 8-10 minutes until lightly browned on the edges. Let cookies cool completely on a cooling rack. 5. Get a double boiler going and melt the white baking chips/white chocolate chunks with the vegetable oil in the top of a double boiler. When chips/chocolate is about 60% melted, remove the top of the double boiler and stir until completely melted and smooth. 6. 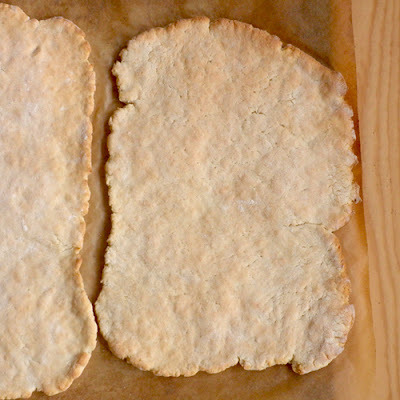 Prepare another baking sheet with a clean piece of parchment paper. 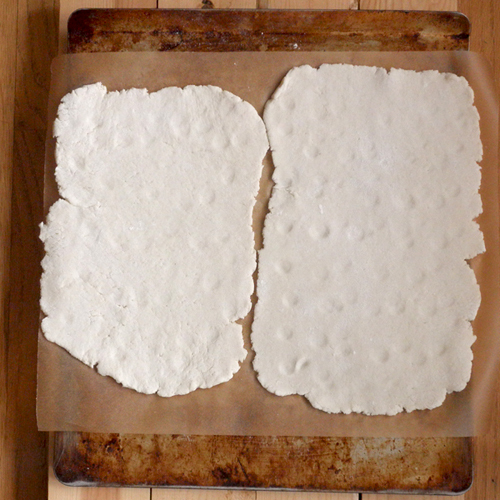 Make one large or two smaller wax paper or parchment cones (see instructions here). Fill a cone halfway with the melted chips/chocolate. Fold top over and carefully snip off about 1/8 inch from the tip. 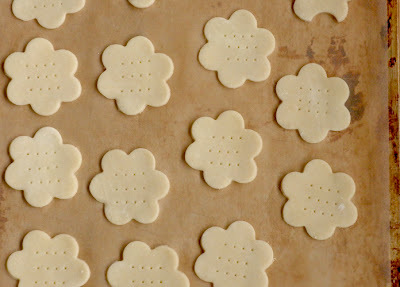 Squeeze a circle in the center of the flower/circle and place parchment-lined baking sheet. After you've done a dozen or so, set cone aside and sprinkle the circle with rainbow nonpareils. Continue with the remaining flowers/circles. 7. When you're done with the circles on top, pick up each flower/circle and squeeze a scant half teaspoon or so of melted chips/chocolate onto the bottom. Place back onto the parchment. The extra nonpareils that did not stick to the tops will stick to the bottoms. 8. Allow chips/chocolate to set up before eating/serving. Store in an airtight container at room temperature. Makes about 7 dozen wafers. The cream wafers shrink quite a bit in the oven.